Red dots are more popular than ever before and the perfect match for AR-15s and other tactical rifles. However, the truth is without magnification, and red dots are nothing more than amped up iron sights. Fortunately, it didn’t take long for companies to figure out ways to add powerful 3x-5x magnifiers to them, transforming red dots with zero magnification into terrific low-powered scopes. 1 Why Use a Red Dot Magnifier? Plus, we’ve included a couple of others that also scored top marks. Why Use a Red Dot Magnifier? Before we delve deep into the best red dot magnifiers on the market today, it’s essential to learn a little about them to choose the right one. 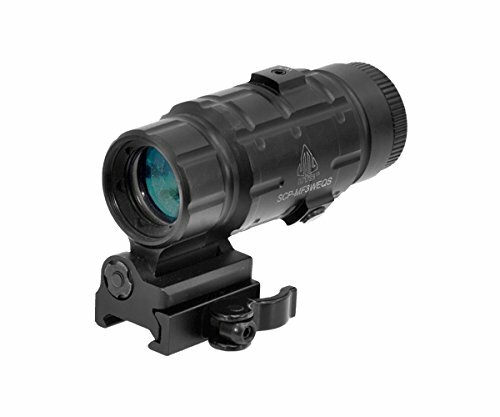 What are the advantages of using a red dot magnifier? What features should you look for? What should you consider when researching and picking one out? How do you use them? We’ll answer all of these questions in order, starting with the benefits of using a red dot magnifier in the field or at the range. The ability to switch back and forth between magnification and non-magnification is ideal for dynamic tactical shooting situations in which targets must be engaged at constantly evolving distances. Operators can use red dot magnifiers to perform recon and mid- or long-range shots. 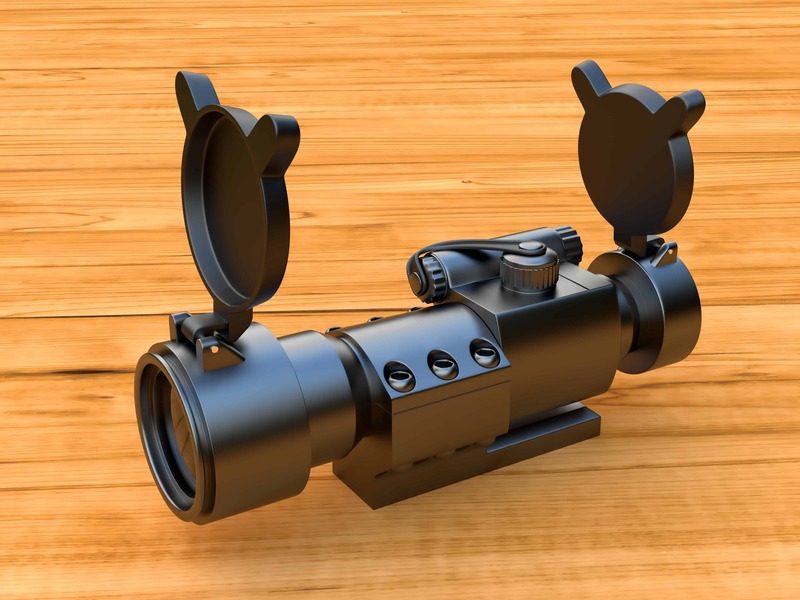 Magnifiers with slide or flip mounts also allow shooters to move the magnifier out of the way for close range targets. In other words, you don’t have to worry about being pigeonholed into a single role when shooting with a red dot magnifier. Red dots have large reticles and zero magnification, which means they’re best used in close quarters for targets no further than 100 yards. The good news is red dot magnifiers provide from 3x-5x zoom to extend your shooting range significantly. With a red dot magnifier, you’ll be able to achieve accurate, on-target rounds at much further distances. 3x magnification often makes 300-yard shots easily achievable. Even if you’re not aiming at targets hundreds of yards away, a red dot magnifier can be an excellent reconnaissance tool. The best red dot magnifiers can flip back and forth to provide a quick and easy way to enhance your vision down range. Most quality red dot magnifiers have a 3X zoom, allowing you to eye up targets over 300 yards away. However, there are also plenty of great options with 4X or 5X zoom for even greater distances and accuracy. As mentioned, one of the significant advantages of using a red dot magnifier is having the versatility to switch back and forth between the magnifier and regular red dot in a moment’s notice. However, this can only be done with the right type of magnifier. Switching from mid- or long-range shooting to close quarter shooting requires the installation of a slide or flip mount. Both of these mount types allow you to quickly move the magnifier in place when you need magnification or out of the way when you don’t. Having an eye relief that is too short will create eye strain and issues when aiming at targets. 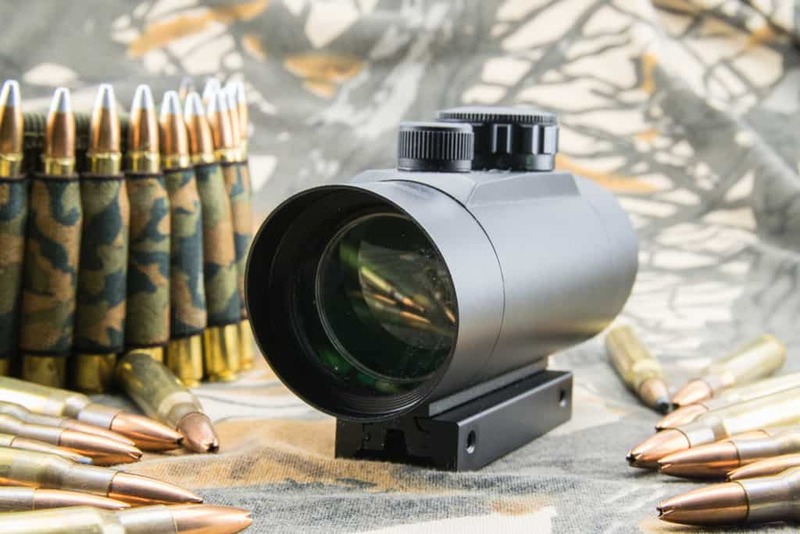 A red dot magnifier may have outstanding optics and build quality, but if it has too short of eye relief, you’ll only end up frustrated and struggling. As a general rule of thumb, it’s usually best to opt for a red dot magnifier with the longest possible eye relief. A red dot magnifier can add a little heft to your gun. This is something you will get used to and notice less and less over time. However, a lightweight magnifier will help lessen the load and allow you to maneuver your rifle better. Just make sure not to sacrifice build quality for weight as lightweight often translates to lower quality and a lack of durability. Tactical weapons are often exposed to harsh weather and less than ideal shooting conditions. A red dot magnifier must be built to hold up in these conditions. A durable, well-built magnifier will not only save you hundreds of dollars in replacements over time and help you shoot your very best at the range or in the field. A red dot magnifier can check all of the boxes above, but none of that matters if its lens quality is subpar. It’s important to find a magnifier with little to no parallax and a focused yet full field of view to scan pinpoint targets downrange. 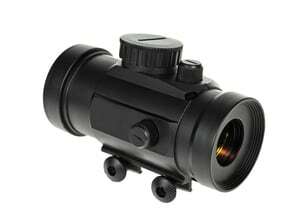 The objective tube and lens diameter are crucial in the performance of a red dot magnifier. A wider diameter will provide you with a broader field of view and allow you to see more of your target area. Conversely, a smaller diameter will give you with a narrower target window and allow you to increase your accuracy downrange. Elevation and windage can play a huge role in the accuracy of your long-distance shots. The right red dot magnifier should have separate elevation and windage adjustments that allow you to calibrate your shots in minutes of angle, or MOA. Turret adjustments are a critical component of red dot magnifiers and rifle scopes as they allow shooters to zero their optics for accurate aiming and shots. Elevation turret adjustments will enable you to move the magnifier or scope up and down in the field for long-range shots. Windage turret adjustments, on the other hand, allow you to adjust it left and right to account for wind direction. 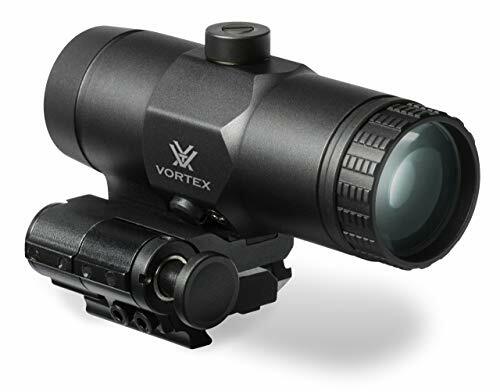 The Vortex Optics VMX-3T is one of the most popular red dot magnifiers on the market. Despite being half the price of more expensive magnifiers, it’s incredibly well-made and holds its ground well. The 3X magnifier features a handy flip mount, which is great for switching from long-range to close combat and vice versa. The mounting system also allows shooters to make on-the-fly height adjustments. The VMX-3T is also compact and takes up little space on the rail. Plus, it’s durable and designed to hold up in a variety of weather conditions. So, not only is it versatile and barely noticeable, but it’s built to take years of use and abuse as well. The durable and compact magnifier is made of high-grade aluminum and nitrogen purged during the assembly process for superior water and fog resistance. It also features a waterproof O-ring for an excellent seal. This means there’s no need to worry about fog, dust, and other particles obstructing your view. Best of all, however, is its lens system. Its ocular eyepiece features multi-coated lenses that provide excellent light transmission, and the reticle or red dot sights are crisp and clear. On the downside, the Vortex Optics VMX-3T weighs 11.9 ounces, which is a little on the heavy side. Depending on your rifle or firearm, it may affect its balance. Another slightly more important issue is its eye relief. Since it is only 2.2 inches, you may need to contract your rifle stock or move the sights down a little on the rail. Nonetheless, if you’re searching for a top-quality red dot magnifier that checks most if not all of the boxes, the VMX-3T may be for you. If you’re a serious shooter on the hunt for a no-frills military-grade magnifier, the EOTech G33 may be right up your alley. Used by the US military, it’s top-quality and ultra-reliable. What makes it so great? Well, for starters, it comes in neat Pelican box along with an instruction manual, optics cloth, and fixed quick release rail mount and spacer. Installation is also a breeze. Just install the two screws, add a little Loctite, and you’re good to go. 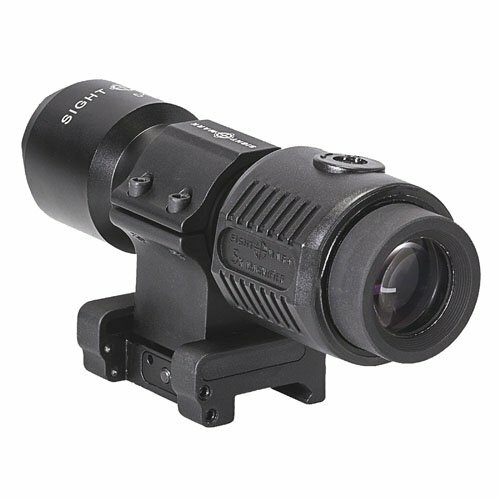 Like other first-rate red dot magnifiers, it’s rugged and features a water- and fog-proof seal. It’s also made in the USA, which explains its quality and price. 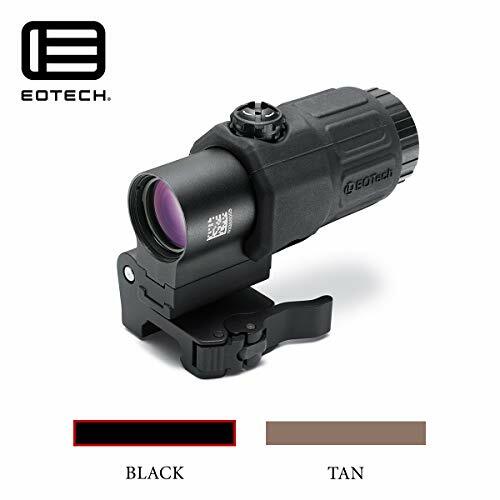 As far as optics go, the EOTech G33 offers a great 7.3-inch field of view and top-notch optics. After all, it’s used by the military, so you can bet its optics are up to par. However, like the Vortex Optics VMX-3T, it has a 2.2-inch eye relief, which could be a bit longer. Is it the best? Well, if you’re searching for military-grade gear and like things made in the USA, then the EOTech G33 is a solid contender worth considering. While it pairs perfectly with EOTech red dot sights, with a little fine-tuning, it will work great with other sights and scopes as well, which is also a plus. If you appreciate a longer eye relief and getting a good deal, you may want to consider the Primary Arms 3X Long Eye Relief Red Dot Magnifier. Now in its fourth generation, it’s vastly improved over previous models in many ways. In addition to being more compact, as its name suggests, it features a longer eye relief. The folks at Primary Arms extended it from 1.9 inches to 2.64 inches, making it considerably more comfortable to use. With its compact design, it also only weighs 7.9 ounces, which is pretty light. However, this is primarily because it doesn’t come with a flip mount. You have to purchase one separately. 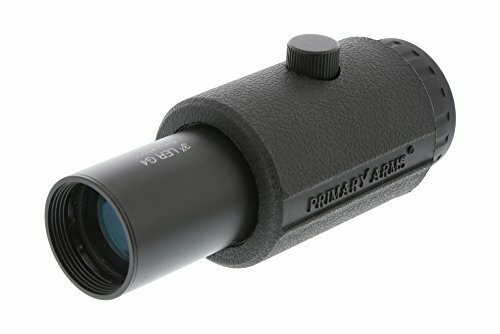 When using the Primary Arms Red Dot Magnifier, you must be perfectly aligned to see its full field of view. While this may be a problem for some novices, a little practice can make this a non-issue. Plus, according to Primary Arms, you can use a lower third mount to improve the alignment, but the choice is yours to make. Despite its lower price, the optics of this magnifier are more than serviceable. 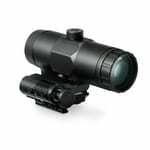 It features a 30mm objective lens that provides clear and accurate vision downrange. Like other quality red dot magnifiers, it’s also water-resistant, fog-resistant, and features an azimuth and elevation adjustments. Unfortunately, it only comes with a one-year warranty, which is a little shorter than some magnifiers. However, for the price point, this isn’t surprising and shouldn’t be too disappointing. All in all, it’s a comfortable and well-priced red dot magnifier for budget-conscious shooters. If that sounds like you, it may be worth giving it a shot, pun very much intended. Speaking of budget-friendly, the UTG 3X Magnifier is one of the most affordable on the market. However, it has a lot more going for it than its budget-friendly price tag. For instance, it’s capable of boosting the performance of your red dot and offering crisp, clear vision while doing it. With fully coated lenses, it produces high-quality images and allows you to shoot more accurately at a distance in a variety of weather conditions. Aside from good optics, it also features a flip mount, which is something generally found on much more expensive magnifiers. With it, you can easily transition from long or mid-range to close-range shooting in an instant. As far as drawbacks go, its eye relief is on the shorter side. It also lacks adjustments and isn’t the best at gathering light. However, it delivers solid performance for the money and is worth a look. Inspired by military applications, the Sightmark 5X Tactical Magnifier Pro combines impressive 5x magnification and slide-to-side mount for quick and easy target acquisition. It’s designed to work with collimated reflex, holographic, and other forms of red dot sights to provide users with both serious magnification and the advantages of reflex technology. This allows shooters to significantly improve target recognition at medium to long-range distances up to a whopping 350 yards. If that weren’t enough, the Sightmark 5X Tactical Magnifier Pro also has an extended eye relief for increased aiming and shooting comfort. It also has a full field of view and multi-coated lenses for improved clarity. What we also like about this Sightmark is the fact that it’s designed to work with red dots from Trijicon, Aimpoint, EOTech, and several other brands. Oh yeah, it just so happens to be lightweight, weather-proof, and super durable as well. With so much to offer, the Sightmark 5X Tactical Magnifier Pro makes a strong case for being one of the best all-around red dot magnifiers being made today. 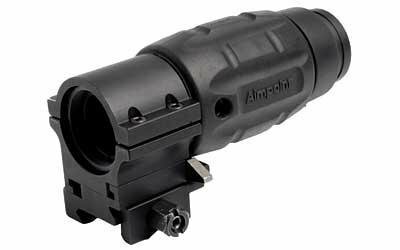 The Aimpoint 3X Magnifier is one of the tops on the market, and for a good reason. First of all, it’s incredibly compact and lightweight. It won’t take up too much space on your rail, and at only 7.1 ounces, it’s hard to notice it’s even there. Unlike many other red dot magnifiers, which often require a ton of adjustments, the Aimpoint makes it super easy to center the reticle. However, a little more adjusting may be needed for non-Aimpoint sights. That being said, the real selling point of the Aimpoint 3X Magnifier is its optics. Not only does the reticle appear crisp and clear, but it produces excellent light transmission, which is excellent for low light conditions. It also has little to no glare. This is a difficult combination to pull off. Regarding drawbacks, at under 2.3 inches, the eye relief isn’t the best. It also doesn’t include a flip mount, which would be quite nice for tactical situations. The good news is, you can purchase a flip mount separately, and pair it with the Aimpoint’s stellar optics for a superior tactical magnifier that’s tough to beat. Unveiled a short year ago, the Sig Sauer Juliet4 was designed to be the perfect complement to the brand’s Romeo red dot and provide terrific magnification for long-range target acquisition and medium-range engagement. 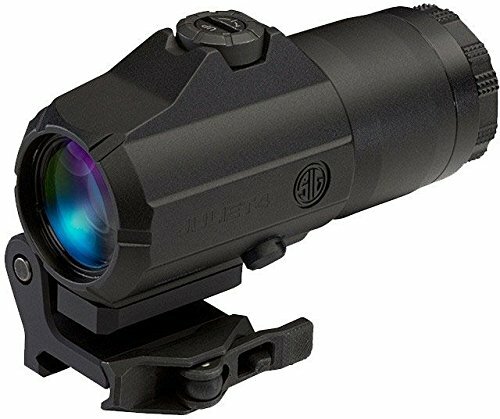 However, it works just as well with nearly any other red dot optic, making it a great choice to round out this list. The new optic features the Sig Sauer’s 90-degree PowerCam mount for quick and easy transitions from medium to close-range shooting. Users can opt for a 1x red dot magnification and sufficient field of view for close-range work or flip the Juliet4 in front of their red dot sight for increased magnification of targets 100 yards or more away. Unlike other flip mounts, the Juliet4 is also equipped with a handy quick-detach feature with recoil lugs to provide a repeatable zero. Plus, some spacers are included as well, allowing shooters to adjust the optic’s bore height to align with the red dot optics perfectly. Pretty neat indeed. The other aspects of the Juliet4 don’t disappoint either. Not only does it feature an aircraft-grade aluminum housing, but it has dialectic-coated prism lenses to provide any red dot with crystal cleat 4x magnification. Did we mention it has a threaded objective lens cover and a rear protective flip cover as well? It’s hard not to be smitten with the Juliet4. It’s only been out a short while and isn’t the most popular red dot magnifier out there, but it’s incredibly well-made and an excellent accessory every shooter can appreciate. Did we mention it comes with a lifetime warranty? Before we leave you to decide which of these red dot magnifiers is best for your setup, we thought it would be a good idea to quickly talk about our top choice and recap the features responsible for landing it at the top of our list. As you can see, there are some great red dot magnifiers on the market to choose from, but the Vortex Optics VMX-3T outshines them all. Sure, the Aimpoint and a few others may perform slightly better from an optics perspective, but the Vortex performs nearly as well and is compatible with a much greater range of red dot options. It’s also rugged and built to withstand almost any weather conditions or tactical situations. However, almost any magnifier is better than none at all. Regardless of which red dot magnifier you choose, it will instantly transform your rifle into a versatile tactical weapon ready for anything you throw at it.